If regular readers noted an absence of theatre reviews a few weeks ago it’s because Mrs Chrisparkle and I were on our travels again. This time accompanied by my Lady Duncansby, we flew to Verona, where we spent two nights, then travelled by train to Padua for one night, on again to Venice for two nights, and then cruised on board the MSC Magnifica to Bari, Katakolon, Izmir, Istanbul and Dubrovnik, before returning back to Venice, taking the train back to Verona and flying home. I hope to cover all that in the next few weeks! Originally we had booked the week’s cruise, but decided we wanted to spend more time in Venice. Checking all the online flight brokers, flights out to Venice were all pretty pricey – I guess it’s a popular (as well as expensive) destination. 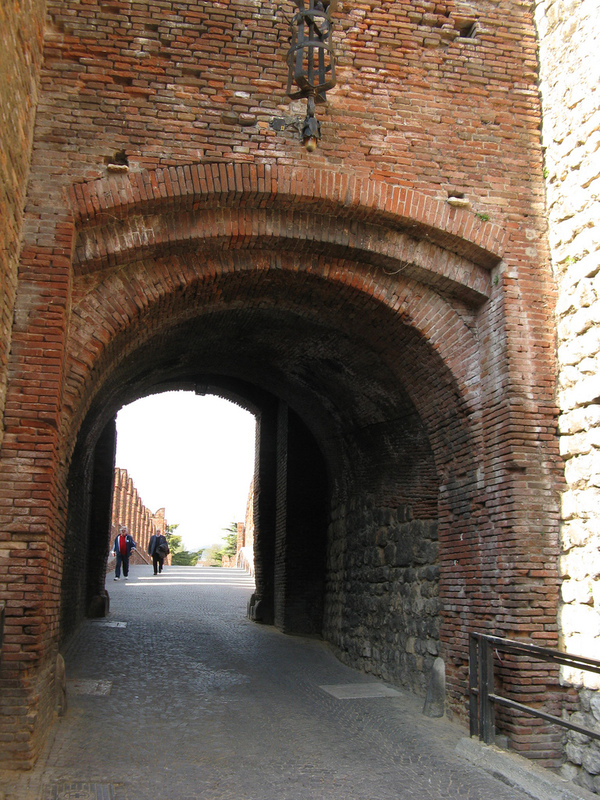 This gave me the idea of looking further afield, and I came up with the solution of Verona. Only an hour or so from Venice by train, and a much cheaper flight. Also we didn’t have to be humiliated by Ryanair staff, yay! It was a service provided by good old British Airways. There was one major disappointment about the BA flight however; no food! I thought they always bunged you at least a snack, if not a meal. But unless you were travelling in first or business, you just got a drink and a clean-up sachet. Not much to clean up, really. And bizarrely, unlike the dreaded Ryanair where you have to buy everything, there was no provision of selling food either. So if you didn’t have a nibble in Gatwick, you were going to stay hungry until you got to Italy. Verona airport is not terribly far from the city but you wouldn’t want to walk it with all that luggage, so your choices are to get the airport/railway station bus service (every 20 minutes) or to get a taxi. I always have an anxiety about just getting into a taxi at a foreign airport, particularly if I don’t speak the language – I always fear that it will result somewhere between getting ripped off for 20 times the real cost of the journey and everyone getting raped and murdered and slung in a ditch. So I decided to pre-book a taxi through Airport City Transfer, who charged 40 euros for the direct trip from the airport to our hotel. Most other similar services wanted to charge 50 euros. I have to say that the transfer worked a dream – I got all the email communication I was promised including clear instructions; the driver was there on our arrival, he took our bags and put them into his nice clean posh Mercedes, drove us straight to our hotel, unloaded the bags and just asked for the 40 euros. A super service, and I would thoroughly recommend it. 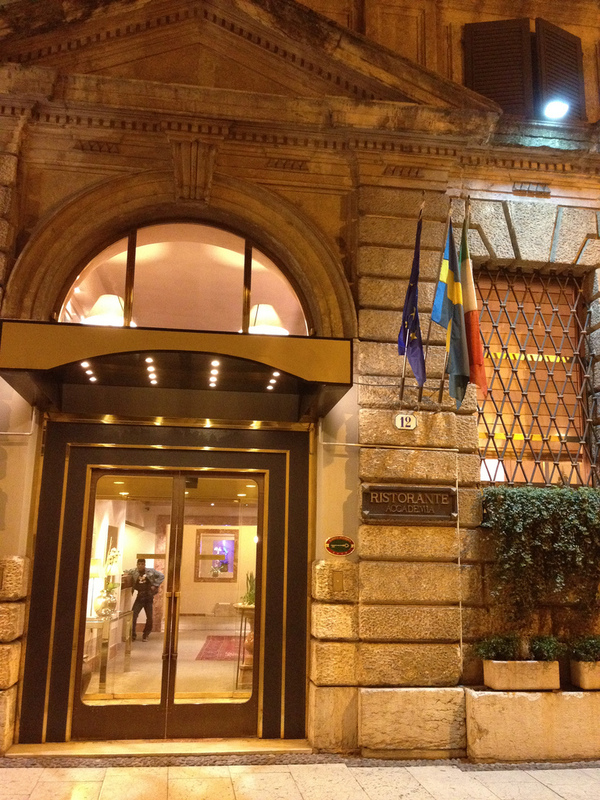 Our hotel was the Hotel Accademia. I chose it because it was “number two” in popularity on Trip Advisor. I see it is now “number one” and I am not at all surprised. It’s a lovely hotel, with very helpful and polite staff, comfortable rooms and bathrooms, a generous breakfast and is superbly located. It also has a discreet and relaxing small bar at the back where you can wind down after a long days’ sightseeing or a long night’s wining and dining. So, off we went to explore. We only had a little time on our first evening before dinner, so we just followed our noses. 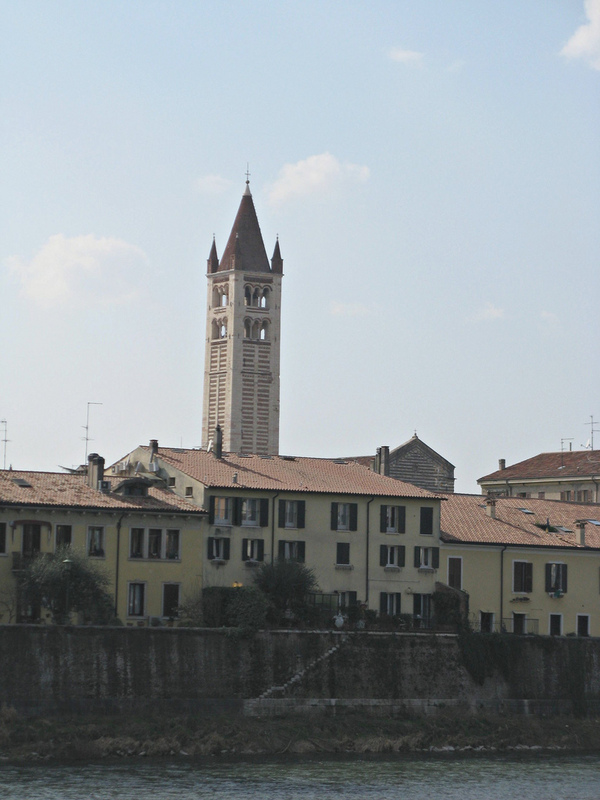 One thing you have to say about Verona – and it was obvious from the drive in from the airport – it’s stunningly beautiful. The architecture, the colours, the shops, the people – they all reek style. Elegance just seems to appear naturally. Not a place for bargain shopping, I should add: I found a nice trendy black bomber jacket in one of the boutiques that I thought might suit me, but then dropped it like a hot brick when I saw how much it cost – 7,000 euros. You’d need Jessie J’s income to forget about that particular price tag. 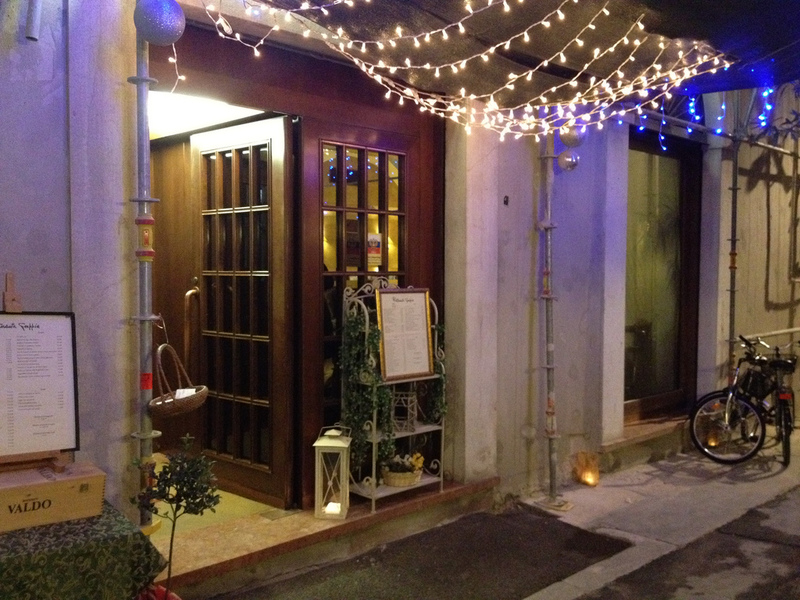 The hotel is just around the corner from the Piazza Erbe, so that became our favourite local haunt. Elegant old palazzo type buildings enclose a market square, mainly selling tourist type stuff but not exclusively; frescos adorn the upper storeys of attractive looking bars and cafes; there’s a charming old Roman statue in the middle of the fountain; and the wonderful old Venetian lion statue atop its column. It’s a genuinely lovely place. Not over pretty; not over serious. Just the kind of place where life takes place and you feel privileged to share in it. 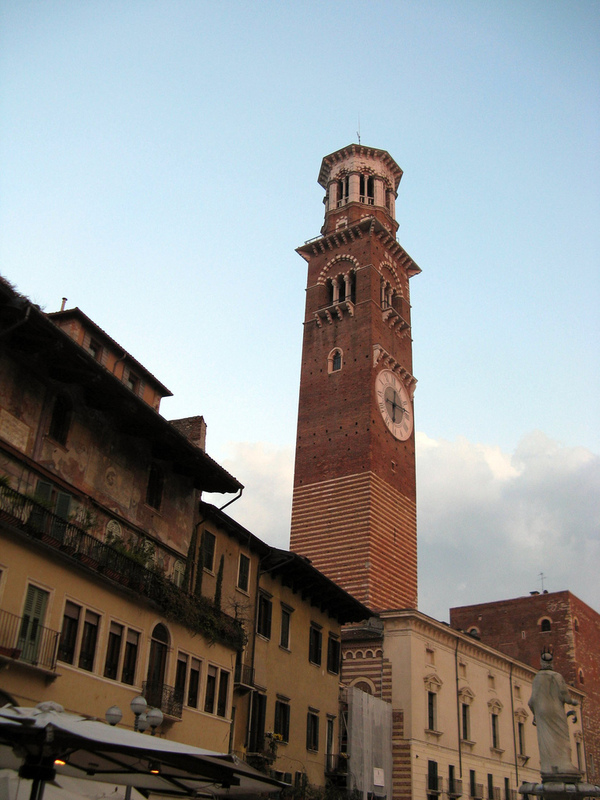 The cityscape here is dominated by the Torre dei Lamberti, that rises beside the old law court in the adjacent Piazza dei Signori. We decided early on that we weren’t going to attempt its 84 metre ascent, although I expect the view is stunning. 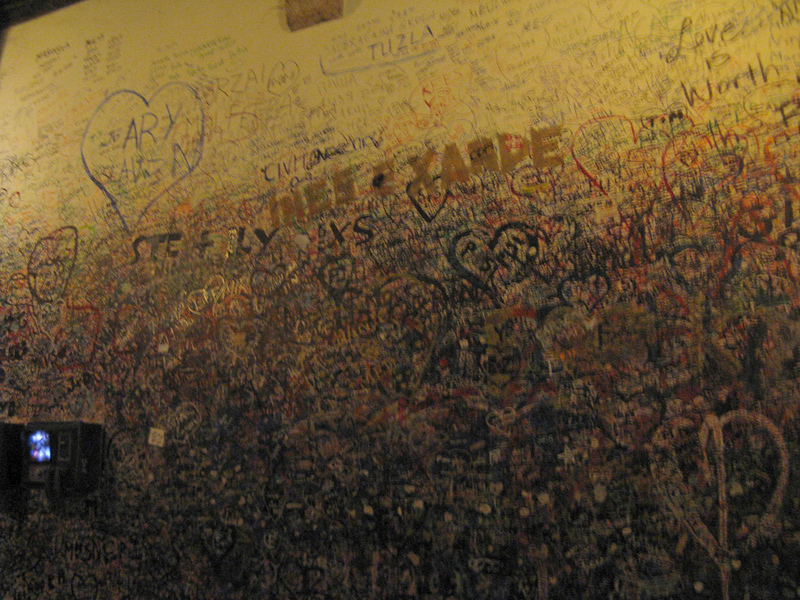 We wandered away from the Torre and discovered a courtyard that was covered in graffiti. Mrs C and Lady D strolled round the yard, which was full of backpacking students, whilst I looked more closely at the graffiti. We carried on, slightly bemused. It was only about 24 hours later that I realised this was the Juliet’s balcony complex, and, basically, we missed it. Never mind – a balcony’s a balcony at the end of the day. 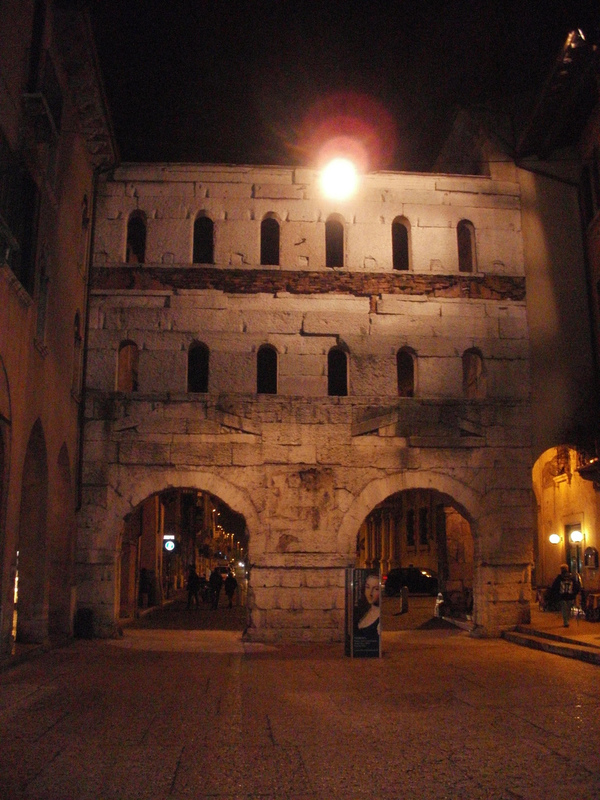 We followed the Vias Cappello and Leoni and turned right opposite San Fermo Maggiore, which we would visit more properly the next day, and continued walking round until we found ourselves outside the famous Arena – very unspoilt and mysterious looking at night. 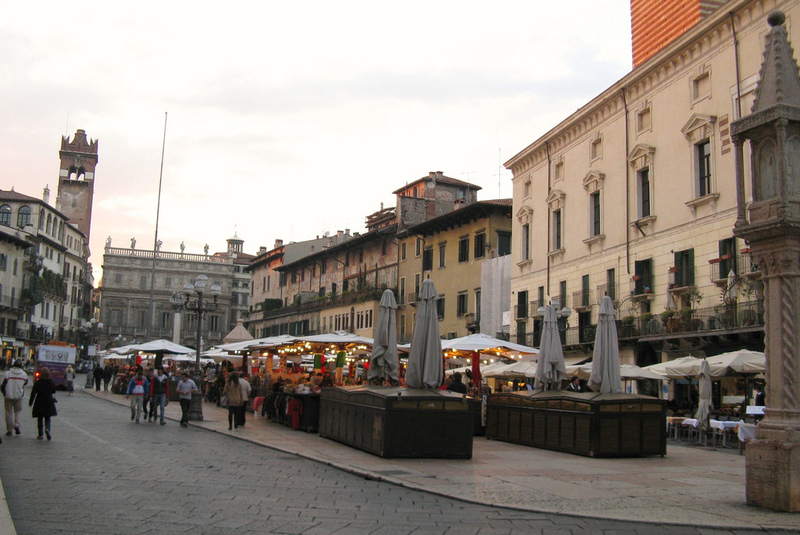 Alongside the arena is the Piazza Bra, a long square lined with tasty if touristy looking restaurants. After a couple of false starts we ended up in one of them; regrettably I can’t remember its name but it was comfortable and the food was very good. What I did admire – and this was not the only time it happened on this trip – I asked the waiter to recommend a suitable local wine for the meals we had chosen and his recommendatio came right at the cheap end of the wine list – and it was excellent. Quite unlike the rip-off experience I just avoided in Rio last year. After all that walking, eating, and general travelling, it was bedtime – or should have been. A brief dip into the hotel bar for a nightcap, and we were done in. But then we couldn’t resist nip out again to the Piazza Erbe for a late night drink, and had a jolly nice glass of Chianti at the Caffe Brasserie Filippini. I had meticulously planned the next day’s sightseeing – one module in the southern part of the city and another in the north. But first we thought we ought to time the walk to the railway station in case we didn’t go by taxi the next day. My advice – don’t bother. For one thing, we never actually found the railway station, even though we had a clear map to follow. Secondly, who wants to drag cases all that way – including lots of cobbles. You’re on holiday – it’s just not worth it. Get your hotel to book you a taxi. It’s a ten minute drive, and you won’t regret a cent. Walking back into town the first place on my list was Juliet’s Tomb. What an odd experience this is! First of all, Juliet is a fictitious character. Some bright spark in the 1930s thought they would create a tomb for her, purely to satisfy the needs of tourists – he didn’t mention anything about the needs of his own bank balance. So her tomb is in fact an empty sarcophagus in the crypt of San Francesco al Corso, which presumably at some earlier time housed the remains of some other unfortunate late person. It’s atmospherically quite creepy though; and the church itself has been converted to a museum with frescos and other art works, which are well worth a look. The guards here are keen as mustard to make sure you aren’t doing anything untoward with their exhibits; but they are chatty and informative, and above all happy to see you finding it interesting. 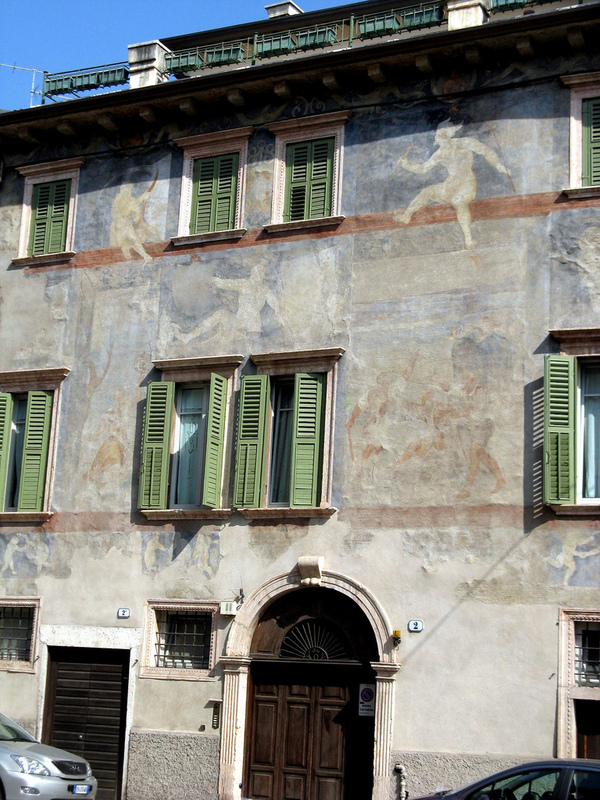 Strolling past the old city walls at via Pallone and some amusing frescos in via Dietro Pallone, we found ourselves once again at the Church of San Fermo Maggiore. 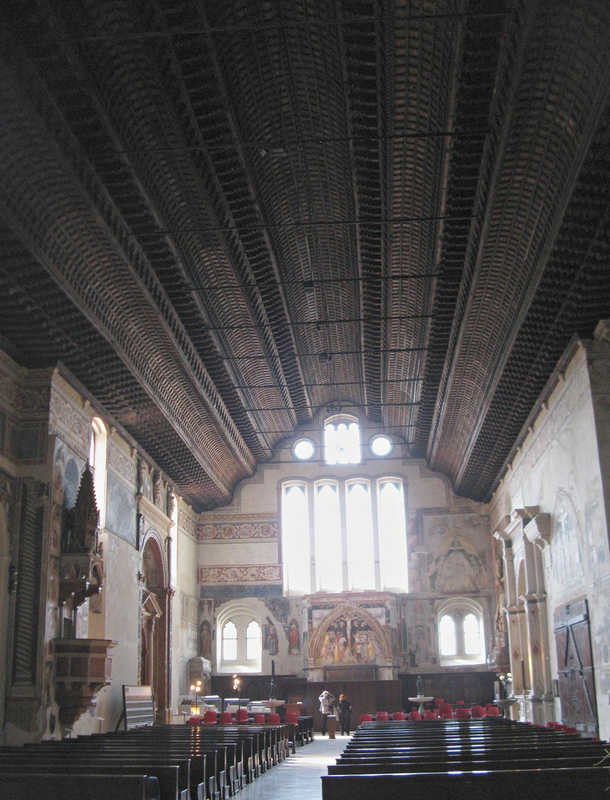 It’s a fascinating place, and well worth paying the entrance fee, as it’s essentially two churches in one – a lower church begun in 1065 by Benedictine monks and an upper church restored sometime in the 14th century. 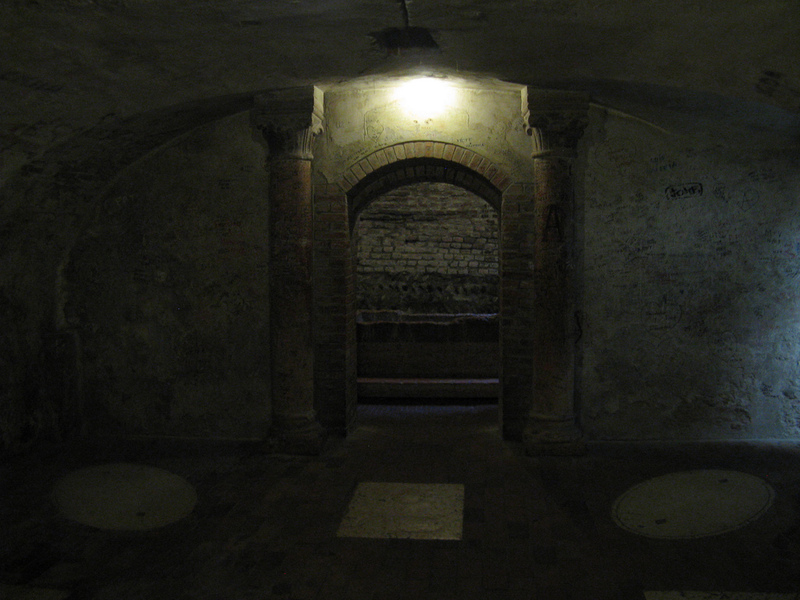 The lower church feels very crypt-like, and Lady D found it a bit spooky. It has a huge ship’s keel ceiling though. Nice frescos and some good solid hinges on the big wooden doors – always a satisfying sight. Retracing our steps from the previous evening, we walked round to the Arena, resisting the temptation to pose for a photograph with an out of work actor dressed as a gladiator. 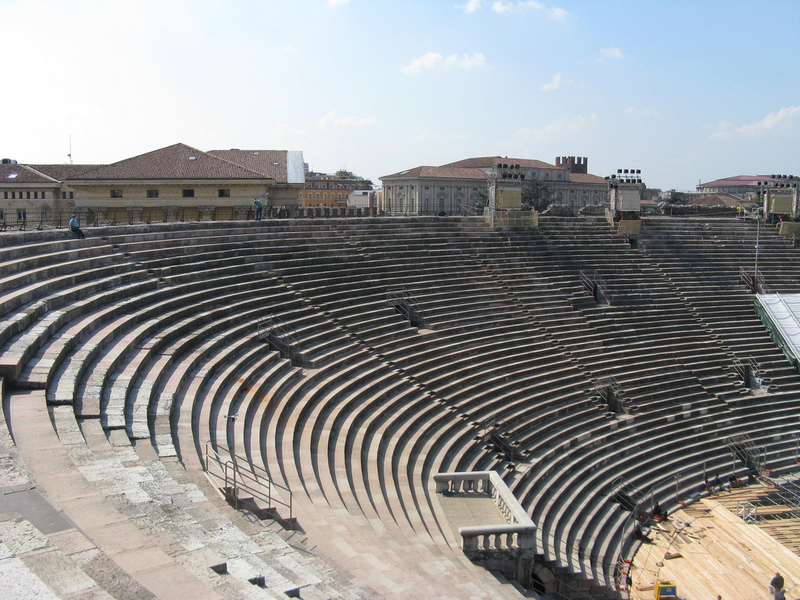 Apparently, it’s the third largest Roman amphitheatre in the world, after the Colosseum in Rome and that at Santa Maria Capua Vetere near Naples. Of course, this is where the opera is famously performed, but there was none on whilst we were there. It was fun just to explore the place – hopping around seats and rows, in and out of entrances and exits, playing Christians and Lions and largely ignoring the roped off no-entry areas where some guys were doing some building work – well, we didn’t get in their way and it was perfectly safe. You get some impressive views from the topmost back row all over the city. It gave you a rewarding feeling of being at one with history. Well worth the visit. Another nice lunch in the Piazza Bra, this time at La Costa, with a great view and friendly service; perfect in the spring sunshine. 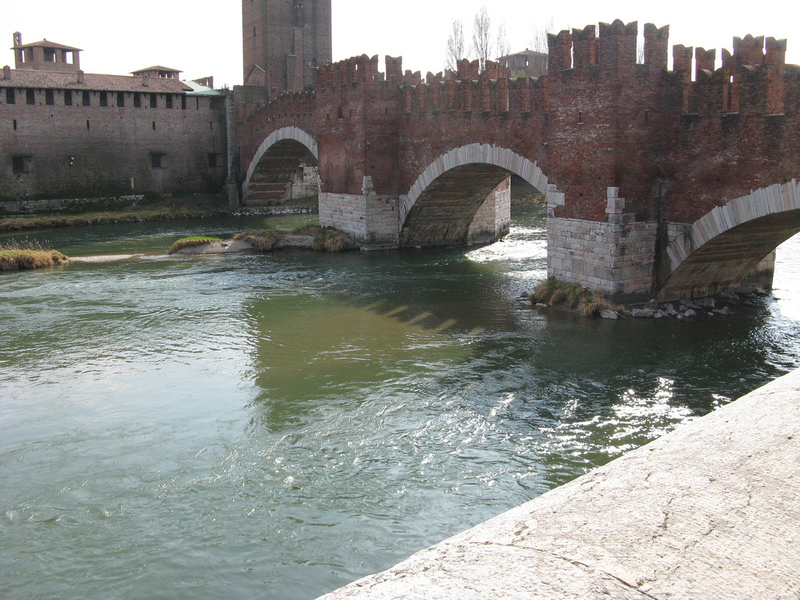 We crossed the River Adige by Ponte Vittoria and took a quiet charming walk along the river bank, past the Ponte Scaligero – a medieval bridge that got blown up during World War Two and was rebuilt from masonry rescued from the river – along to Ponte Risorgimento and our first view of the tower of San Zeno Maggiore. 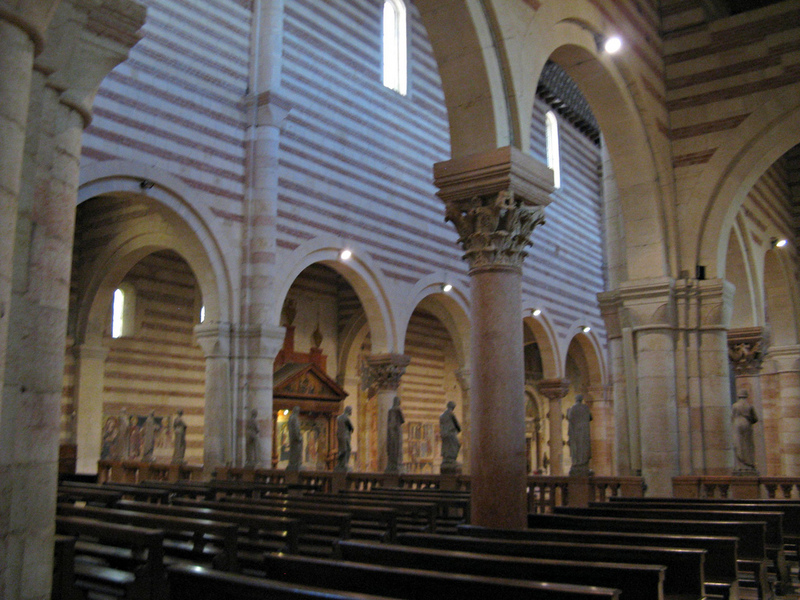 San Zeno Maggiore has to count as one of the world’s gmost spectacular churches. Built in the early 12th century, it boasts a fantastic ship’s keel ceiling, a dark and mysterious crypt, fabulous bronze door panels, colourful old frescos – it has it all. 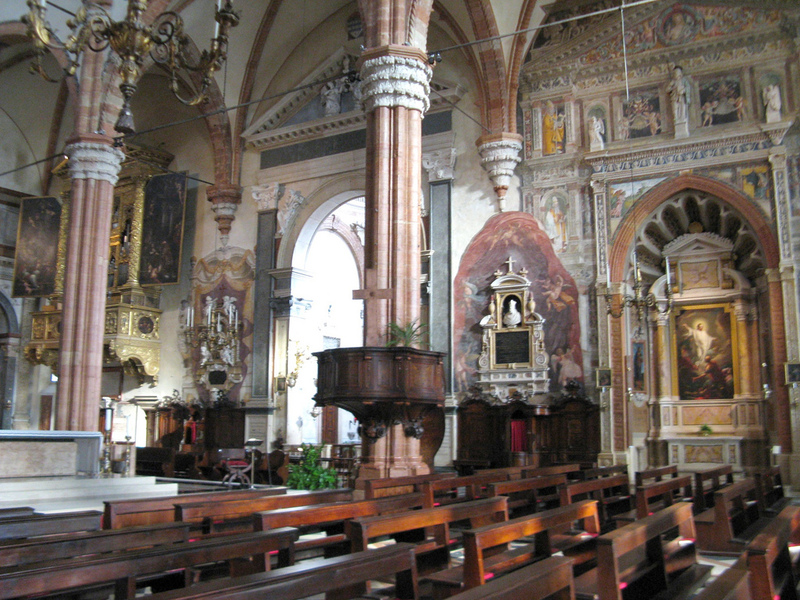 San Zeno is Verona’s patron saint; Lady Duncansby was so taken with the place that she has adopted San Zeno as her own personal saint. It’s a wonderful place just to lose yourself for half an hour. From there we wandered past the Castelvecchio, which looks like a grand old building, but decided not to investigate their art collection as we wouldn’t have enough time to give it the attention it no doubt deserves. Instead we carried on back past the Piazza Erbe and on to the Duomo. It’s another magnificent building, with beautiful art and architecture, and stunning ceilings. From the river by the Duomo you can look across the water and see more churches and the Roman Theatre. There’s an art to a happy day’s sightseeing – don’t get too exhausted. We would have liked to carry on, but the effect of all this magnificent church art is that you get satiated. I don’t think we could have crammed in another sight. Instead we drifted back to the Piazza Erbe and had a really nice drink and snack at the café that seems to attract the most locals – I can’t remember its name but it’s the one that’s at the farthest north-east corner of the square. Then it was back for a rest and out again for dinner. Using the Trip Advisor app on the iPhone (brilliant!) we discovered Greppia. What a fantastic restaurant. The food and drink was excellent – the ambience buzzy and sophisticated, and the service friendly and efficient. Regular readers will know that Mrs C is a coeliac and they knew precisely what to recommend at this restaurant and it was all delicious. I had the Calf’s Liver, Mrs C the Tagliata beef with rocket salad and Lady D the pumpkin risotto. It was a super little find. 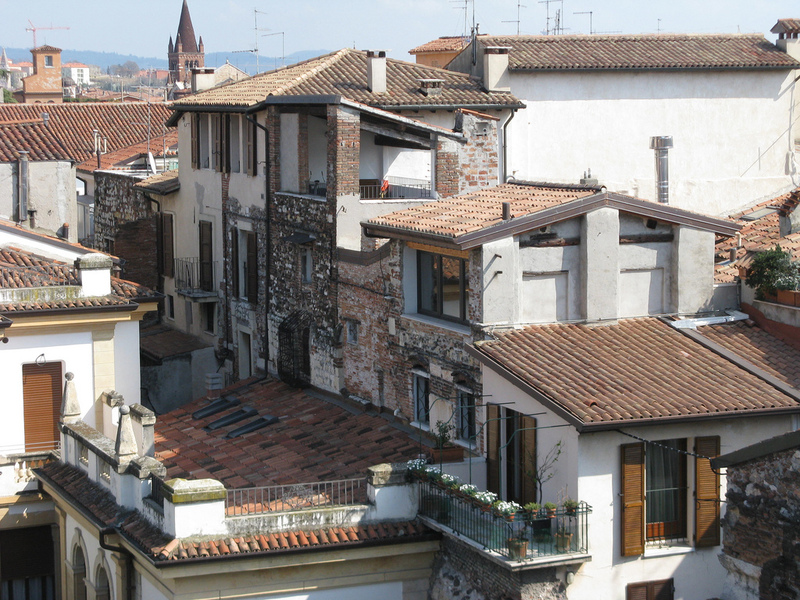 A day is certainly not long enough to do Verona justice – but we did our best! Sophisticated and friendly – which don’t always go together – we loved it. The next day we would be taking the train to Padua. 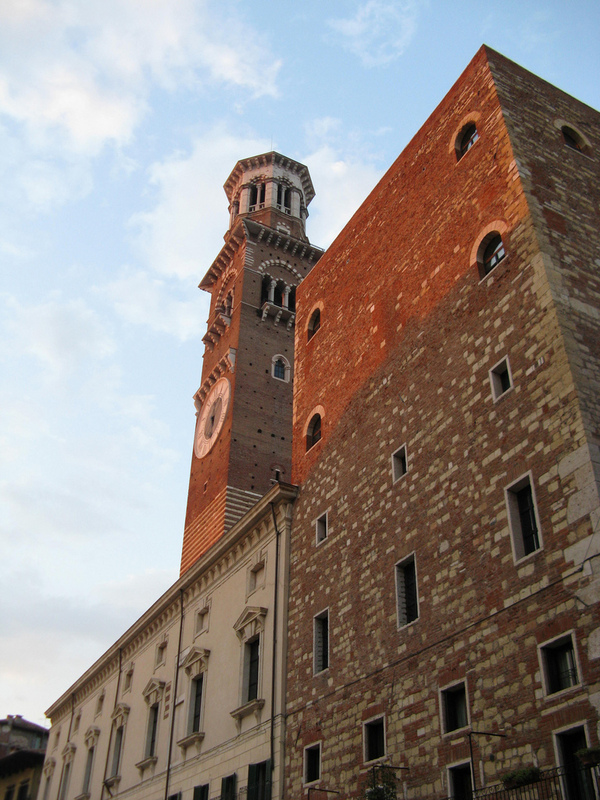 This entry was posted in Travel and tagged arena, chris sparkle, Duomo, Hotel Accademia, Italy, realchrisparkle, San Fermo, San Zeno, Verona. Bookmark the permalink. Nice post – and great pics!! 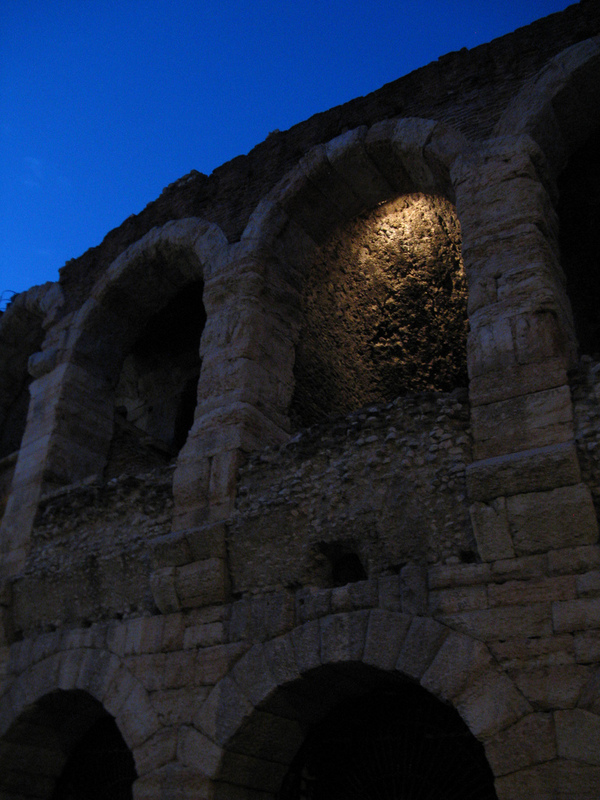 Verona is such a nice city – I visited some years ago and the Arena was awesome! Agree mac, I was very impressed – I had no idea it would be so beautiful. Thanks for your comment!